1964 'Daisy' Ad: The still haunting commercial run by Lyndon Johnson against Barry Goldwater, showing a little girl counting daisy petals. TEMPE, Ariz. (AllPolitics, June 3) -- In a packed auditorium on the campus of Arizona State University, friends, family and members of the U.S. Congress paid tribute Wednesday to one of the great public servants of the 20th century, former Sen. Barry Goldwater. Goldwater served three decades for Arizona in the Senate and was the unsuccessful Republican presidential nominee in 1964. He died Friday at the age of 89. The elite of Arizona's current political scene, both Republican and Democrat, travelled from Washington to eulogize the man known as "Mr. Republican." Yet all of the political remembrances in the public memorial service were overshadowed by two very personal tributes, one from Robert "Thunder Bear" Tree Cody the other from Goldwater's brother, Robert. Sen. John McCain, Goldwater's successor both in the Senate and in spirit, remember Goldwater as a unique figure in American history: a politician and military leader who did not fall victim to the power of his position, but a man who stood by his principle and his party. "He was a superb military officer but he was also an extraordinarily gifted politician. That he was an unusually open, honest and no-nonsense politician did not make him unsuited for the profession, only uncommon. In uniform and in politics Barry's purpose was always the defense of freedom. And nobody before or since managed the task more ably or more colorfully than Barry Goldwater," said McCain. 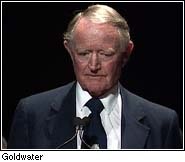 "Others wanted to remake human nature, Barry Goldwater appreciated it as it is," said Arizona's junior Senator Jon Kyle. "It was a privilege to know someone who was as obvious in his virtues as he was in his opinions ... he was, as he wished to be remembered, an honest man who tried." Interior Secretary and former Arizona Governor Bruce Babbitt remembered Goldwater as eternally linked to his state's greatest natural wonder. "Barry Goldwater and the Grand Canyon stand together; both unique, both monumental, both among the very best of God's creation. And I believe Barry Morris Goldwater will be remembered as long as each morning the sun continues to rise over the Grand Canyon," Babbitt said. 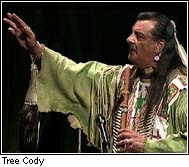 In the most emotional moment of the service Native American Robert Tree Cody, also known as Thunder Bear, performed an original piece of music composed in the tradition of his Maricopa and Dakota ancestors. 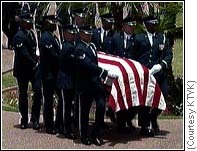 He ended his performance by turning to Goldwater's casket, holding back tears and saying, "You, you are a great man. You are with the elders now. You are a chief. My people will never forget you as long as we shall live." As if giving the audience a glimpse into the character they were there to celebrate, Goldwater's brother Robert took the stage and displayed the humor and plain spoken gratitude that seems to define his family. "After hearing all the great things about Barry, reading them in the paper and on the screen and then driving out here today and the funeral procession and seeing all of the people lining the side walks; I think it really might tempt me to ask for a recount," said Goldwater referring to his brother's landslide defeat in the 1964 presidential election. Robert Goldwater went on to remember many humorous stories in his brother's life before politics. He admitted his brother wasn't an excellent student, and described the genesis of his love of country then Goldwater nearly broke down as he ended by saying how proud he was of his brother. Former Senator Bob Dole, House Speaker Newt Gingrich, Sen. Fred Thompson, and former first lady Nancy Reagan were also in attendance. Barry Goldwater's body will be cremated and a newspaper reports his ashes will be mixed with those of his first wife and spread in the Colorado River in the Grand Canyon.  Who Are Plato Cacheris And Jacob Stein?